• Once again, a sincere thank you to everyone who has taken the time to respond to ‘The Garden Report’. Lynn Shaw and I chatted in the middle of Angus Blvd. and she expressed how pleased she is to receive this blog. Kelly Pierson has been forwarding a copy to her friends and says they are enjoying it. Fifteen others took the time to email their comments. • Our neighbor, Laura Ross and her husband Terry dropped by with family on Canada Day to check out our garden. Laura was very kind, proclaiming it to be the finest in town (humility never being my strong suit). While the garden is still suffering from the hail storm, Laura and Terry understood as they live only two houses down and theirs was hit, as well. Congratulations to Laura on her promotion to cabinet minister. • Also dropping by for a garden visit was Roberta Nichol. Maureen was home so the two of them enjoyed a chat on the swing. Did you know that Roberta has retired from her teaching career? Her last day occurred this past week and now she has the time to garden and hopefully resurrect her singing career. For those who were not at The Folk Festival in the 1960’s and 1970’s, Roberta was a featured performer and she is one talented lady. • Weeds, weeds, weeds! Ten of you took the time to file complaints with me about weeds in your gardens, as if I am ‘The Commissioner for Weeds’. (RCMP readers, please do not misinterpret the word ‘weed’.) Here is what I have to report. Our friend and reader, Ingrid Thiessen sent me photographs and information on the blue flowered weed that has taken over Lakeview. It is out of the campanula family and is known as bluebell, not to be confused with the ornamental bluebells. I managed to delete the photo of the blue bell weed, sorry. • Another weed that gardeners are complaining about has a heart shaped or arrow shaped leaf and it twines itself around plants. It is field bindweed though Mike Liske’s crew over at The Classic Landscape Company have named it ‘strangler weed’, which is very appropriate and descriptive. • Reader Marg Hryniuk sent along a photo of the scentless chamomile which has taken over many areas of the city. Marg reports that she has found to her horror, people actually cultivating the plant. It is considered a noxious and invasive weed by The Department of Agriculture. I have included a photo of the weed that Marg forwarded. Scentless chamomile should not be confused with the oxalis daisy. 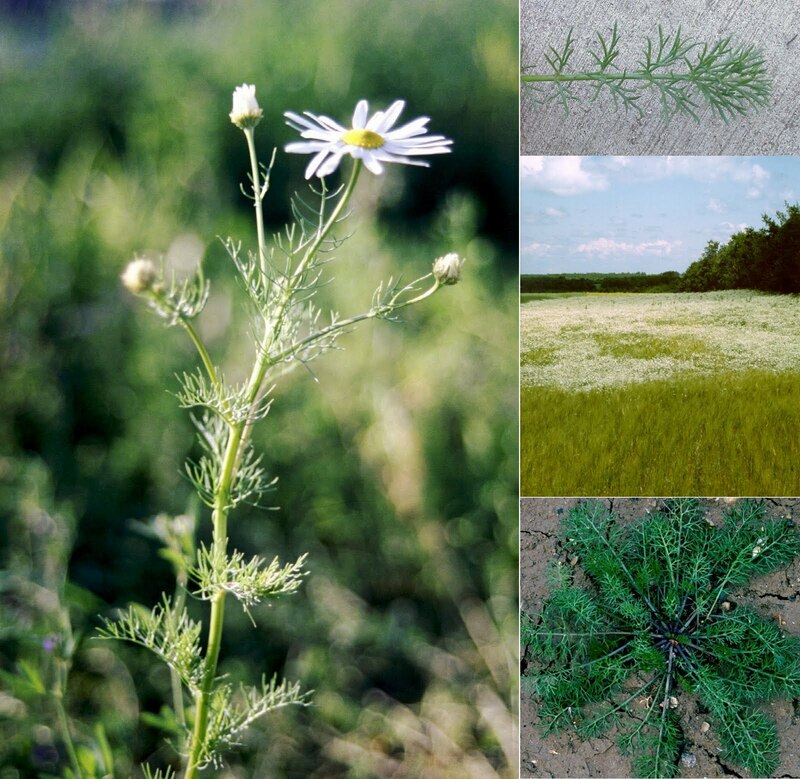 Scentless chamomile has stringy leaves as you can see in the photo whereas the oxalis daisy has broad leaves. • Blooming this week and last: Mock Orange! Lovely medium sized shrub that grows around six feet tall (sometimes a bit more) with white blooms from June 25 until July 10th every year. When a gardener cuts the blooms and places them in a vase with water, the entire house will be filled with the smell of oranges the next morning, thus its name. There is not a lot to recommend this shrub other than its blooms. Maureen and I went for a walk through the neighborhood on Tuesday last, to count the mock oranges and there were many to be seen. We also found a house on McCallum cultivating the scentless chamomile. I should alert Marg. • Also blooming this week are most people’s roses. I only have one, a ‘Morden Sunrise’ which while not fully hardy, has performed well for me for ten years. I do cover it up with lots of peat moss every fall and then pile on the snow. • I received two inquires regarding poor blooming peonies this week. Here are the details for growing peonies. First, your peony root must contain three to five eyes for it to bloom in its first few years. Second, it must be planted in lots of sun. Peonies in the shade live but do not bloom well. Third, peonies must not be planted too deep as this slows down their bloom time. That is the basics. If you love peonies, there is a peony society in town. • Writing about peonies, reminds me of our gardening friend Bernie Zaharic, who can be heard on CBC Radio One. Bernie values his peonies and does not hesitate to spend a hundred dollars or more for a rare variety. He had one of those rare ones planted in the front yard and became so nervous about plant rustlers that he moved it to the safety of the back. Now, before you start to laugh, any good gardener will confirm that I am not making up the term ‘plant rustler’. It is what we call plant thieves. Our neighbor across the street was recently raided for some prized plants and so have I been victimized. When I had Lakeview Gardens, I would drive into the parking lot around 6:30 a.m. to find that my test flower beds in the parking lot had been raided by shady (pun intended) gardeners. They had arrived at five a.m. How you can tell the difference between gardeners and vandals is gardeners always clean up after themselves. They actually take the time to fill in the hole and rake it even. How considerate. • You don’t have to steal these, I will give them to you. I have two pots of day neutral strawberries and two pots of daylilies to share with readers. They were dug out of my garden to make room for tomatoes. • After watching the news and reading the paper, I am reluctant to complain about my hail damage. Those unfortunate souls in Saskatoon, Maple Creek, Yorkton and Kawakatoose Reserve have been severely impacted by mother nature. The reporter covering the storms for CBC Television has been Dani Mario. She is a lovely, young woman who is doing a very good job for CBC. I coached Dani at the boxing club when she was fifteen so every time I see her on television, I have a ‘proud papa’ moment. • Speaking of fifteen year old girls…I have never regretted that we had three sons, all of whom gave us a run for our money through their teens. What we went through was nothing compared to what my friends who have daughters have had to endure. I make this statement without hesitation: Boys are easier to raise than girls. That should get a few responses. • I try to drop by The Italian Star Deli every Saturday and of course, Carlos is always a real treat to visit. Another person who treats me very well when I am there is Luanne. She has been employed at the deli for many years and is one of my favorites to assist me. Even though her name doesn’t sound it, she is very, old school Italian and knows her cheeses and deli meats. I thought that someone as nice as her deserves a plug in The Garden Report. • Planted my basil for the third time. It really does not like cold and wet. Some people have planted their cucumbers three times as well. It still makes me laugh when I hear people say they never lose a plant, that they are perfect gardeners. Perfect ‘Fiber McGee’s’ is more apt. • How to grow beautiful geraniums: Plant in full sun. Water well. Fertilize regularly. Be a ‘heavy pincher.’ Don’t be afraid to reach in and take a depleted flower, stem and all, as close to the main part of the plant as possible. This encourages new blooms. • Saw some lovely begonias in color shades I have not seen before at Sherwood Greenhouses. Excellent plants at this business. • Sad to see The Book and Briar closing its doors at the end of July. The pressure from electronic books, Amazon, Costco and Chapters all made it difficult for this independent to survive. Bookstores are going the way of small hardware stores and greenhouses. When they are gone, we will miss them. Costco sells popular books at a discount but are they going to carry local authors or those specialty books that only sell a few copies in each location? Or will they special order something for you? I think not. • Watering: Always a difficult answer. When it is warm, every three to five days for most planted items. Hanging baskets and containers should be checked every day. When it is cooler, once a week is usually adequate. Use your common sense more than hard and fast rules. Don’t be one of those people who give their dieffenbachia a cup and a half of water every Tuesday and then don’t know why it is not doing well. Also, morning watering is always better than any other time. Deep watering is always preferable to shallow watering. • Summer in the city. I know that the noise level increases every summer. I have lived on this corner for thirty-seven years and we border Regina Avenue and are very close to Albert Street. But this year, we have more idiots on motorcycles than ever before, letting us know they are cruising the strip with their ‘vroom vroom’ throttles. Surprisingly, the worst offenders are not punks or street trash, rather they are middle aged dudes experiencing a second childhood on their Harley’s. To top that off, there are these ‘boom box’ stereos with four wheels that cruise by. You know the ones that shake your windows and rattle your bones. I have often thought it would be a great idea for my neighbors and I to capture one of these drivers and restrain him in my basement while we play Lawrence Welk medleys or Don Ho’s ‘Tiny Bubbles’ over and over on a continuous loop. But that would just be plain wrong. Grump. Grump.